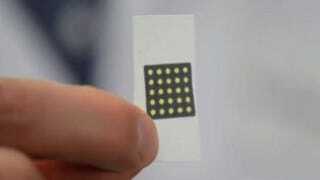 Though it may not look like it, this tiny piece of paper is actually a biological machine. It's a paper-based synthetic gene network that, in a very litmus-like way, can be used to sense disease-causing microbes, including certain strains of Ebola, or medically important molecules, such as glucose. It could be a while before we see this pocket-sized device deployed to field stations, but it could radically change the way diseases are diagnosed outside of the lab. Developed by researchers at the Wyss Institute at Harvard, the achievement could result in inexpensive, shippable, and accurate test kits that use saliva or a drop of blood to identify specific diseases or infections. It works in a process similar to computer programming, but instead of electronic components, it utilizes biological ones. Gene circuits contain dozens of genes, plus the proteins required to read those genes, much like an operating system reads a computer program. Combined, the genes and proteins can carry out a task. The key to the breakthrough was in figuring out how to print sequences of DNA on paper, and then freeze-dry them for storage at room temperature. The DNA is re-activated by adding water. Once the process gets underway, the paper changes color if a chosen target — like a specific RNA strand or molecule — is present in the water. The test can produce results in as little as 30 minutes. The system is quite flexible, so the researchers can create all sorts of sensors. For example, the gene networks built by the Wyss Institute researchers can trigger color changes after detecting specific genetic material, such as those from certain bacteria or Ebola viruses. [James] Collins and [Keith] Pardee demonstrated a variety of effective paper–based tools ranging from small molecule and RNA actuation of genetic switches, to rapid design and construction of complex gene circuits, to programmable paper–based diagnostics that can detect antibiotic resistant bacteria and even strain–specific Ebola virus. The Ebola sensor was created by using the paper–based method and utilized a novel gene regulator called a "toehold switch", a new system for gene expression control with unparalleled programmability and flexibility reported in the second study in Cell. Although its inventors had designed the toehold switch to regulate genes inside living cells, its function was easily transferred to the convenience of ordinary freeze–dried paper, showcasing the true robustness of both the freeze–dried paper technique and the toehold switch. The Ebola sensor was conceived by Wyss Institute Postdoctoral Fellow Alex Green, Ph.D., co–inventor of the toehold switch regulator and lead author of its report, after the ongoing West Africa crisis brought the deadly pathogen to global spotlight. Due to its easy assembly and fast prototyping ability, Green was eager to test the paper–based platform as an operating system for the toehold switch, which he had initially developed for programming gene expression in living cells. Green reached out to Pardee and together they assembled the prototype Ebola sensor in less than a day and then developed an assay that can differentiate between Sudan and Zaire virus strains within an hour of exposure. In addition, other tests were developed that detect genes from antibiotic-resistant bacteria. Remarkably, the technology could also be printed into fabrics, which could be worn as clothing by medical staff. The freeze-dried paper slips can be stored for an entire year at room temperature. The researchers estimate that the cost of manufacturing could be as low as just 2 to 4 cents per sensor. Check out the entire study at the journal Cell, "Paper-Based Synthetic Gene Networks."